So, Ralph the Wolf was pretty good; let's see how another giant monster works out. 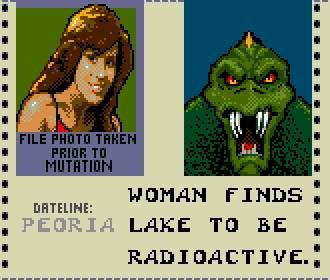 In the old games, Lizzie was a human woman who was mutated into Fin Fang Femme after swimming in a lake that had been poluted by radioactive waste. In the upcoming movie, well, no one actually knows yet, but the odds are good that it's just "normal crocodile gets big." There are two subseries in this line, giving us a decent idea of how the movie's story is going to go: there are the "Canister Contact" sets, where the animals are just slightly bigger than usual, and then there are the "Big City Brawl" sets, where they're totally the size of a bus. So clearly we can piece together that the animals are exposed to some substance (which was supposed to be contained in a... small drum of some sort) and then they grow gigantic and start fighting. In a city. Yes, it sounds stupid, but we can hold out hope that it's the good kind of stupid. For one thing, the animals don't just get larger, they also get progressively more mutated. 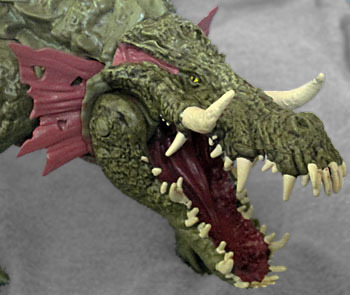 Lizzie may have begun as an average alligator, but by this point she's a walking war machine. Her scales are thicker and sharper, providing armor that a dragon would give its approval. A series of larger, pointier scales run down her spine, culminating in a blossom of spikes on the tip of her tail. 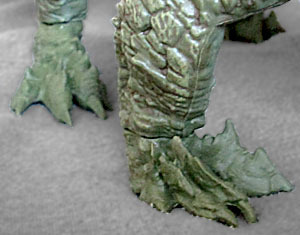 In addition to the usual claws, her feet now have sharp protrusions on top of the toes. She has big flaps of skin behind her head, like a frilled lizard, and has developed a pair of tusks like an elephant or boar. This is a scary looking creature! Lizzie is mostly green, but the paint apps are surprisingly detailed. She's not one flat shade, but rather gets washes and drybrushings to bring out all the detail in the sculpt. 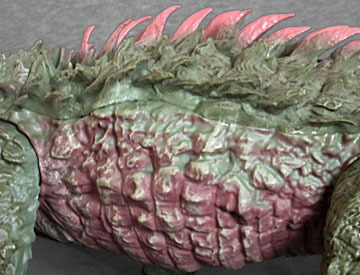 The spines on the bak and tail are pink, while her belly is a pale green and a muddy brown. All her teeth and her tusks are a bright off-white, while the inside of her mouth is a dark red. (Full disclosure: there are more unpainted teeth inside the mouth, both top and bottom.) Her eyes are yellow, with small slit pupils, and as for the ear-flaps, they fall somewhere between the belly and the back both in terms of body geography and color palette. While Ralph seemed very skinny, the only odd thing about Lizzie's proportions is that she's able to hold herself up off the ground despite her increased mass. The body is a nice barrel shape, with thick legs bent beneath it and the tail nearly but not quite dragging on the ground. She has the posture and silhouette of an alligator, even if the details are much wilder. Sure, in the games she was bipedal, like Godzilla ["Goddesszilla" --ed. ], but in the movie she's definitely more of an animal. 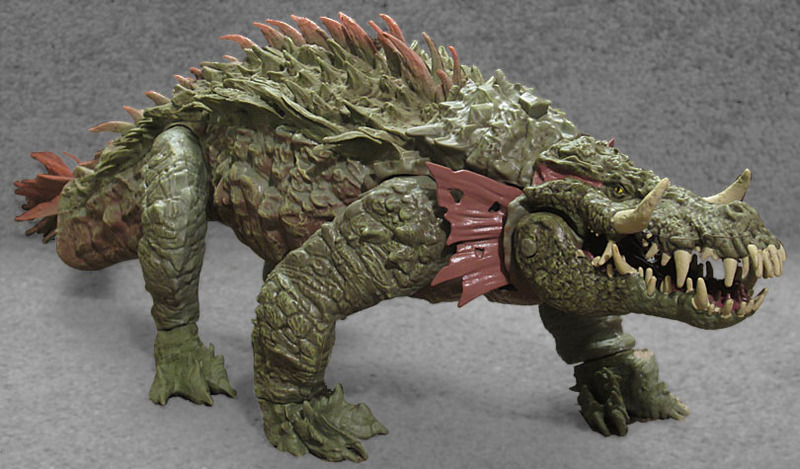 We don't get a lot of articulation here: really just swivels at the shoulders and hips, plus a loose hinge in the tail that serves as one of the toy's play features: it swings back and forth, allowing her to smash other figures with her thagomizer. The other play feature is found at the other end of the toy. Press the button on her neck, and her jaw opens and her frills spread wide. Theoretically, it will close again automatically when you release the button, but it's possible to get the jaw to "stick" in that position, allowing you to keep it open. The boxes these figures are sold in measure 16" x 7⅛" x 5½", and even then, Lizzie is too big to fit inside: you have to attach her tail after you purchase her, bringing her full length up to ~22½". Add that to the height of 5½" and a width of about the same, and you've got yourself one humongous she-creature! Of course, all that size means there's no room for a piece of scenery, like Ralph's chewed-up bus, but you'll never miss it. However, we do still get a human soldier for her to eat. Presumably this is just a re-use of one of Lanard's existing The Corps! figures, but we'd certainly never be able to tell. This still isn't The Rock, just another generic white boy in camouflage, but this one has better articulation than Ralph's: he has hinged knees, a T-crotch, swivel waist, hinged elbows, swivel biceps, swivel/hinge shoulders, and a balljointed neck. 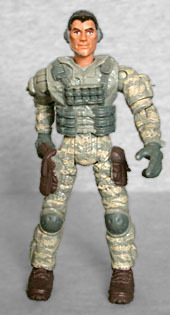 The proportions are slightly more cartoony than GI Joe ever was, but considering this guy is nothing but scenery, we'll forgive that. Just like we'll forgive the fact that only the front of the toy is painted, or the fact that he has no accessories. Pack Blowfist is here to chew bubblegum and get eaten by giant monsters, and brother, he is all out of bubble gum! Nobody was really clamoring for a Rampage movie, but it's happening anyway. And as long as the movie is happening, we might as well get some toys. Movie Lizzie may not look at all like videogame Lizzie, but that doesn't mean she's not good. Personally, I'm going to put these with the Safarai Ltd. Desert Dragon as crazy beasts for Wonder Woman to tame.